The Ordinary Life of an Extraordinary Girl: How many sports can one kid play? How many sports can one kid play? Yes, for some of you, I know that is a rhetorical question. For me, it was not something I thought a lot about when Alex was born. I did not envision she would be my athlete, but, wow - was I wrong. Alex did not start walking until she was at least 2 1/2 - with kids with down syndrome this is not unusual. The low muscle tone makes it difficult for the child's hips and legs to act together to walk. In Alex's case, because we were seeing the cardiologist, we also found she had an issue getting blood to her lower extremities. If this had not been discovered - she would still not be walking. So, when she was 21 months old - she had coarctation of the aorta repair. I think tomorrow I may share that story. Tom, our third child was born when Alex was a little over two years old. This meant that for a long time we had a double stroller and I was carrying two children up and down stairs, into cars and generally all around. The image of this still makes me laugh - but for a period in my past I was very strong. Good thing I was young. Once Alex began to walk she was unstoppable. She often used a mobile aide to help her as she found her strength. We had a walker for her - but in some cases she preferred Tom's stroller with Tom inserted. One of my favorite (but scary) memories was the time John was outside with the kids - and as most parents know - it only takes a second. Alex managed to turn Tom's stroller around and started to take him on a tour of our neighborhood. Thankfully, some adult walkers intervened, turned then around, and brought them home. This image of my 3 year old daughter with down syndrome and her six month old brother taking in the sights of suburban Chicago still brings tears to my eyes. At five years old, the team sports began and have not stopped. We started with tee ball - which in itself was quite amusing. As Alex was still trying to work out her gait - which according to the physical therapist was nothing to worry about - she just needed strength - she would often stumble over her feet when running the bases. Once again this makes me smile - not at my daughter's misfortune, rather at the gasps from the other parents as I chuckled at Alex. 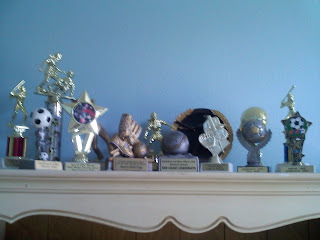 The next sports were softball, soccer, swimming, and ice skating. We were told in order to keep Alex strong we should stress sports. Then we went on to basketball, skiing, horseback riding, tennis and a successful attempt at snowboarding. During the Special Olympic season, Alex participates in bowling, skiing, snow shoeing, swimming and track and field. She loves all of these sports and will pour her heart in to them. I am so excited she will have the opportunity to share her passion with the 3,000 other athletes at the Olympic Games. To set the record straight - Alex is never the best player on a "regular" sports team - but in her early years she was never the worst. As her peers have grown, they have surpassed her in every way - but she has also grown - just at a much slower rate. Many of her team mates have been kind and caring - some have not. But her pride in a job well done trumps them all. Our most recent experience on the JV basketball team at high school was one of our best. The coach insisted that Alex play and the girls had "Alex plays" - one on defense and one on offense. The offensive play consisted of the girls feeding Alex and blocking the defenders in order for Alex to score. This was successful more than once - and not only was Alex proud of her goals, so was her coach, her teammates and the audience. Sometimes, when I have had a bad Alex day, I listen, in my mind, to the applause that accompanied Alex's basketball goals last winter and it lifts my spirits. Once again - another unsung hero in lives.